Finally, I've had a chance to photograph the big project that I've teased you about, then went on trip after trip before having the time to post about them. This project was waiting in the wings (a.k.a. the garage) for a long time. I purchased these about 8 months ago at our Habitat for Humanity ReStore. They were brand new in the box so they had several, but they were dated by their bright, shiny, brassy finish. However, with their classic shape, large size and $50 price tag I knew I had found some winners. I took the measurements and went home to consider them. I wasn't sure on the size, so I made a very crude mock-up with some posterboard to get an idea of what they might be like over the island. It's may be hard to tell from the photos, but these lanterns are LARGE. They are about 18" wide and the main lantern portion (not the chain) is 30" tall. We decided to hang them a little high just to have plenty of head clearance, so the bottom edge is 38" from the top of the counter. They are spread apart just a little more than I wanted them to be, but we had to work with the position of silly things like studs and ceiling braces. Whatever. Everything in me wanted to paint those lights a fun color, but since our floor plan is so open I thought I'd better keep it consistent with the other lighting, which is all Oil-Rubbed Bronze. One of the best parts is the cool shadows these lights throw up on the ceiling. Did you notice the new design on the chalkboard wall? I borrowed some lyrics from one of my favorite Brad Paisley songs...I think it's so true and applies to so many things in life! 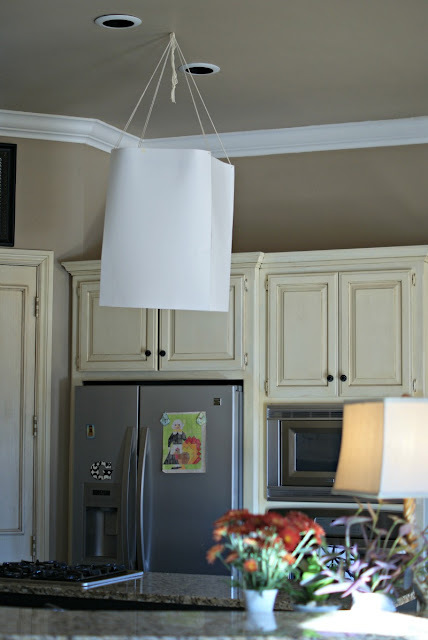 Soon I'll have a follow-up post to show you what it took to make these lights work for our kitchen. 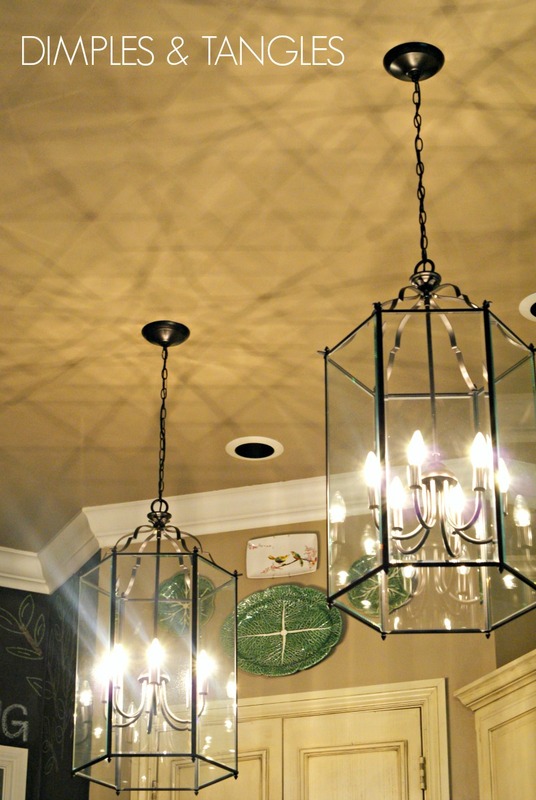 (*edited to add- go here to see the details of how we installed the lights.) It was a semi-major project and there's lots of details! I have one more project getting done right away in the kitchen, and if you follow my "Kitchen" board on Pinterest you might have a clue as to what it is! I wanted to make sure that you all know that I appreciate your comments SO much! They truly keep me going. I've made a new commitment to answer each comment in a timely fashion, so if you don't get an e-mailed reply from me, it means that your comment came to my spam folder as a no-reply blogger and I can't respond. Rats, but that's been happening a lot lately, even with many of you established bloggers! Just wanted to let you know what the problem is in case you don't hear from me. Also, if you've e-mailed me a specific question or comment and I haven't responded, please ask me again! I'm trying to go back through my inbox to those I might have missed, but I'm afraid some might have slipped through the cracks since I've been gone so much this summer. I want to be as helpful as possible, so just get back with me again! Wow! That looks fantastic. Great move buying those lanterns and just think of the money you saved. 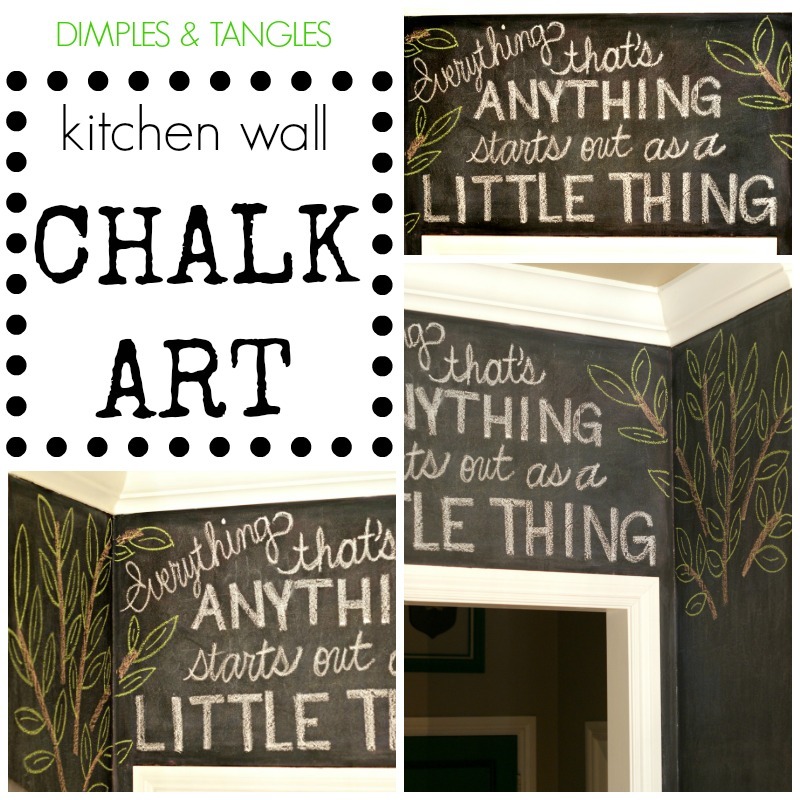 Your chalkboard wall is wonderful too. The additions of the lanterns and the chalk art really makes an impact! Love that quote too! 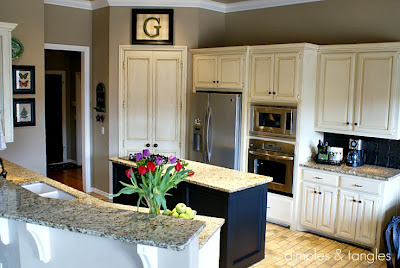 Fun to catch your guest post over at Brittany Makes yesterday!! ;) Have a good one! oh wow!!!! they are perfect!!!! LOVE their awesome shape and scale! I could not possibly love these any more than I do! The lights are gorgeous, Jennifer! I absolutely love Habitat for Humanity Restore Stores...I always find the coolest light fixtures there. I love the way your kitchen looks with chalkboard wall, too! So pretty! 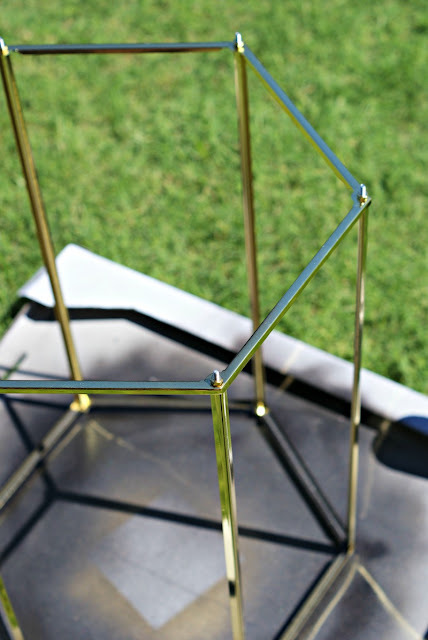 There are beautiful and just perfect for the space!! 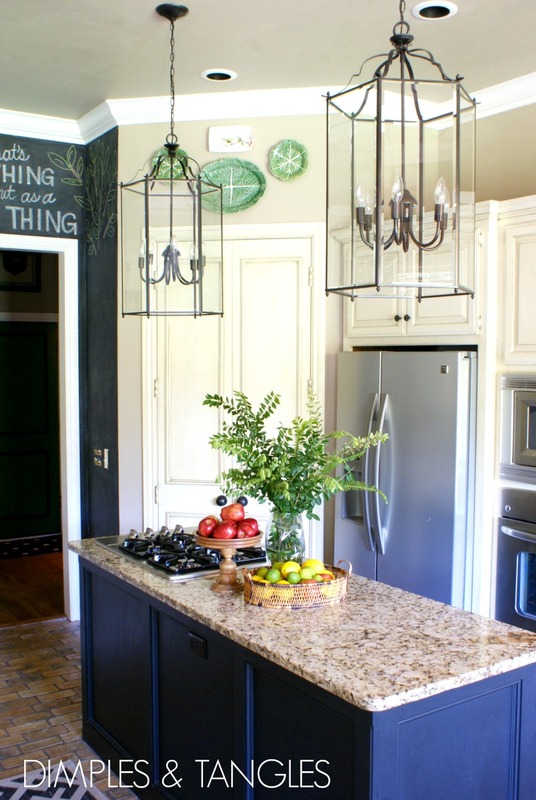 I love when I see large fixtures in the kitchen!! A lot of people are afraid to go big but since your lanterns have a lot of glass they don't look bulky. Great job, it looks awesome!! The lanterns look great!! Such a lovely kitchen. I'm glad you mentioned the "no-reply" thing with comments. I've noticed it too. A lot of bloggers are now showing up as no-reply when they never have before. From what I've noticed, it's the ones that have Google Plus. For some reason, as soon as they add it to their blog, they show up as no-reply. Weird. Anyway, great post! Get. OUT. I would have guessed you snagged those beauties at some fancy schmancy boutique! LOVE them. I say go big or go home. You've got my wheels turning - I have been wanting to add some statement lighting above our island. It's smaller than yours, but we have a similar kitchen layout. I think it would really make a statement - just like yours do! 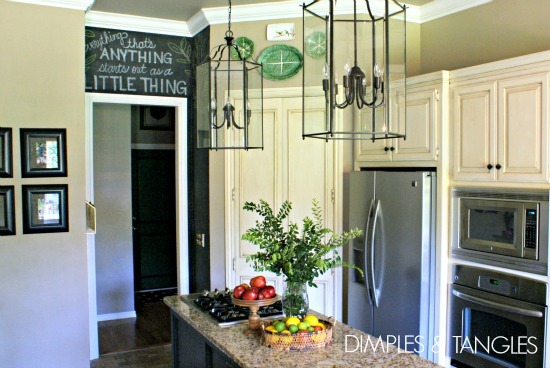 Jennifer that adds so much to your kitchen! And how cool that you used something inexpensive and painted it to make if fit your style and it looks so high end and expensive! Love it! LOVE them... that last shot is so pretty!! Looks so beautiful. 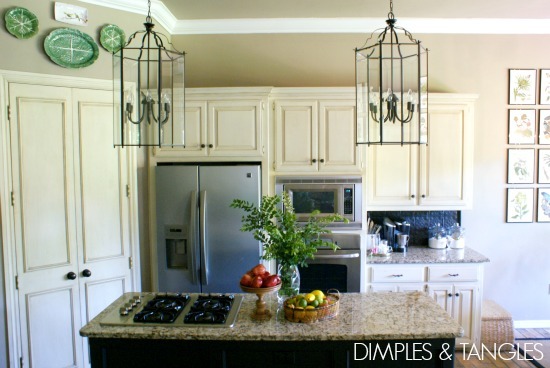 I love lanterns in the kitchen! And the chalk art is so fun! Totally love this Jennifer! They are so cool and with you already tall ceilings they really make the room look bigger! Nice work lady! Wow! Stunning!!! I would love for you to share and link up at my weekly TGIF Link Party if you haven't already this week. Your favorite posts, most popular, recent or new! The party is open every Thursday night and closes Wednesday's at midnight. Followed by (Not SO) Wordless Wednesday! http://apeekintomyparadise.blogspot.com/. I love the new lights and that chalkboard wall adds just the right touch! Very nice! I love how "delicate" they are....which means they are not heavy but add so much to the area! Great job! Vow! its look amazing and its a good giveaway.Thanks for your excellent good idea,i love it. You got some skills! Simply Awesome! 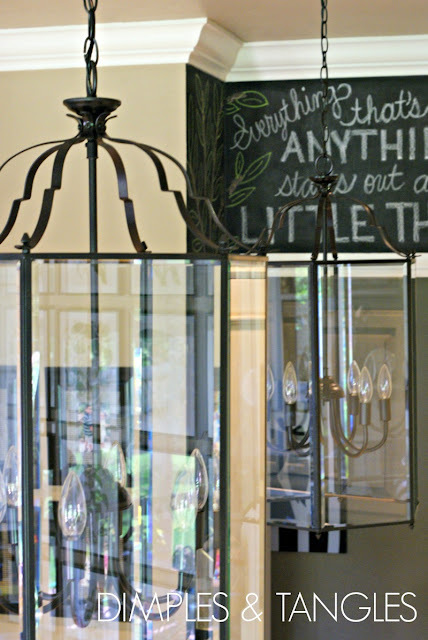 Lanterns perfectly suits classic or French style kitchens.